The Pope rankled Jews in Rome last month by moving Pius XII further down the path to sainthood. 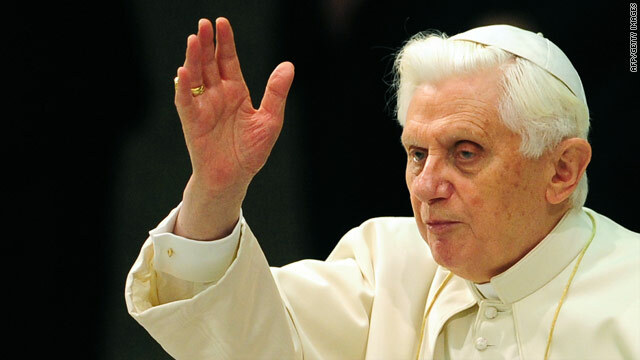 (CNN) -- Pope Benedict XVI is set to take one step forward in Catholic-Jewish relations Sunday when he becomes the first pope since 1986 to visit the main Jewish synagogue in Rome, Italy. The problem is, the step forward comes immediately after he took one step back last month by moving his Holocaust-era predecessor closer toward sainthood. In fact, much of Benedict's papacy has seen swings back and forth in the Vatican's relationship with the Jewish world. The visit to Rome's synagogue is part of what should be an annual Catholic Day of Dialogue With Judaism, but it didn't happen last year. The Vatican had recently reinstated an ancient prayer calling for the conversion of the Jews, decades after it was shelved as part of 1960s-era reforms. Italy's Jewish community pulled out of the 2009 Day of Dialogue in protest. The Vatican reworded the prayer, smoothing feathers, then revoked the ex-communication of a renegade bishop who turned out to be a Holocaust denier. Benedict apologized and visited Israel, then moved Holocaust-era Pope Pius XII a step closer to sainthood. "It seems like 'Groundhog Day' has become the Catholic-Jewish feast," said David Gibson, referring to the Bill Murray comedy in which a man relives one day over and over, unable to move forward with his life. "There is this cycle where the pope is going to do what he is going to do, and then go through the motions of saying 'sorry,'" said Gibson, who writes about religion for Politics Daily and is the author of a biography of Benedict XVI. Sunday's visit to the synagogue will go well, Gibson is sure. "At this point, he is going to say some very nice words about Judaism and Catholicism and the Jews' enduring covenant," Gibson predicted. "Then there will be something else" to set relations back. "There is going to be a dysfunctional cycle until something changes." Lisa Palmieri-Billig, the American Jewish Committee's liaison to the Holy See, was guardedly optimistic about Sunday's meeting, which will be the first time Benedict XVI has visited the synagogue as pope. The Jewish community "believes that Benedict's desire to continue dialogue is sincere. They believe the dialogue and the relationship are very important." But the Vatican's declaration last month of Pius XII's "heroic virtues" -- which puts him on the path to sainthood -- rankles Rome's Jews, she said. The city's Jews were rounded up by the Nazis on Pius XII's watch, she said. "They were there for two days in prison right near the Vatican and nothing happened," she said. "Then they were deported and only 17 came back." The Vatican says Pius XII worked behind the scenes to save Jews from the Holocaust, but has refused to open its archives from his reign to show proof. The Holy See says scholars will eventually be able to examine the paperwork, but not for several more years because of how long it is taking to catalogue and organize. Jewish organizations have repeatedly called for the archives to be opened as soon as possible. Palmieri-Billig says it is critical that the record be clear on Pius XII before the Vatican declares him a saint. "Not that he is a villain; he is not a villain," she said. But "a saint becomes a model of behavior. He is taught in schools. Among the righteous at (Israel's Holocaust museum) Yad Vashem, you have people who risked their life to save Jews." The wartime pope did not do that, she said. "If Pius XII becomes a saint, it will become more difficult to speak the historical truth. He will be held up as a saint. History will be rewritten," she said. "Of course it is the church's business who they choose, but this will have an impact on Catholic-Jewish relations," she said, adding that Rome's chief rabbi, Riccardo Di Segni, has said he will bring up Pius XII on Sunday. The Vatican issued a statement, after declaring Pius XII's heroic virtues, that the move was not meant to attack Jews. Gibson, the biographer of Benedict, said that was true, but also somewhat missed the point. "The restoration of the Latin Mass was not poking a stick in the eye of world Judaism. The move towards the canonization of Pius XII wasn't to provoke Jews. These actions are intramural Catholic politics, and Jews are -- as they have so often been in the past -- collateral damage," he said. But that does not mean the Jewish world should not be concerned. "The church has to realize that at this point in its history, anything it does is going to have an enormous impact on the rest of the world. The pope, like it or not, is a global leader," Gibson said. The turnaround in Catholic-Jewish relations in the past 50 years is astonishing, he said, but that makes it all the more important not to lose momentum. "If the pope is not seen as a friend of the Jews, that can give license to others," he said. But the pope, whom he described as stubborn, will do what he thinks is best, regardless of consequences, Gibson said. "Benedict doesn't take such calculations into account. He is going to do what he is going to do."